Throughout my childhood, we always had a loofah in the bathroom. It was for rough scrubbing of skin to remove all the dead cells, you know. Loofahs came from the sea. They were some kind of corally sort of thing. Everyone knew that. Friend Tim disputed this. 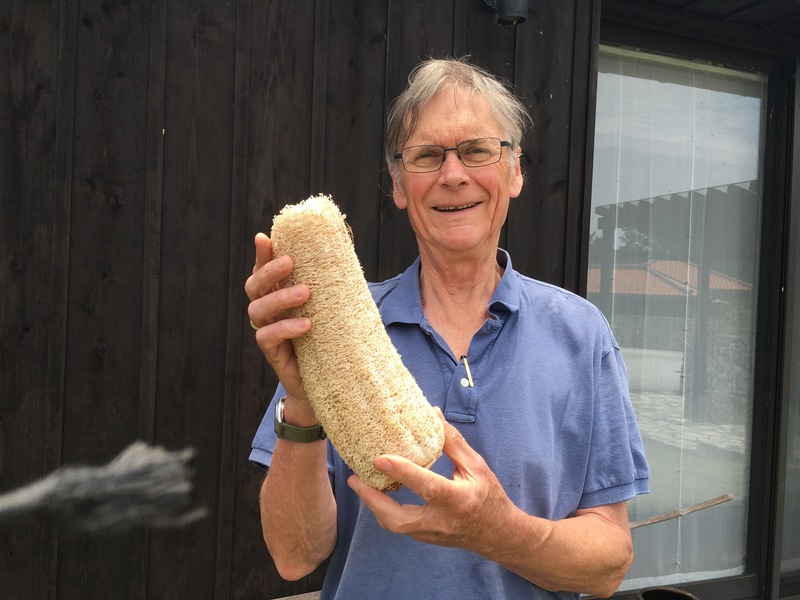 He maintained that the loofah was the fibrous inner structure of a gourd type vegetable. Pshaw! Unfortunately, he demonstrated his correctness by growing loofah against his house. 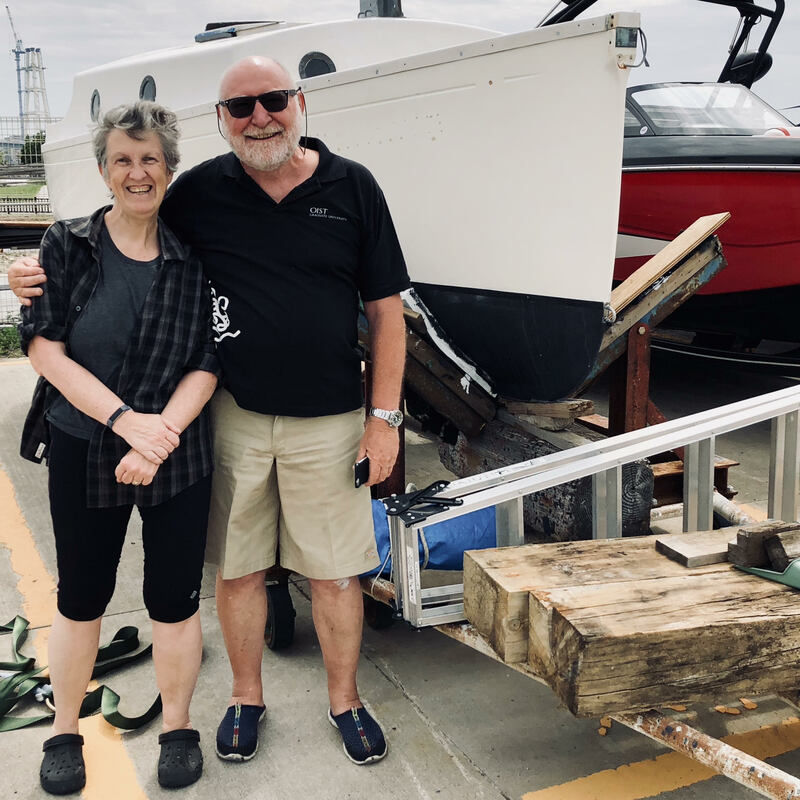 Anyway, Tim, Mary and I go down to look at the boat. The boat makes everyone happy! Tim takes a very sensitive photo of the engine. Prior to the excursion to look at the boat, Saturday in Onna son started as usual. At about 9:00, a lady starts singing and the song is broadcast over the loudspeaker system. The song is very repetitive and reminds me of Gregorian chant. The chant suddenly stops at about 9:45. It thrills me. It is authentic Okinawan culture. It is clearly some kind of religious or social tradition that is miles beyond my understanding. It is always the same song and I imagine that it is played by the Onna Village Office. They only play the recording on Saturday morning. Anyway, I am on my bike on Saturday morning and I begin to worry about my health. The symptom is that the strange chant seems to grows louder and softer. Suddenly it gets very loud indeed and then I understand. 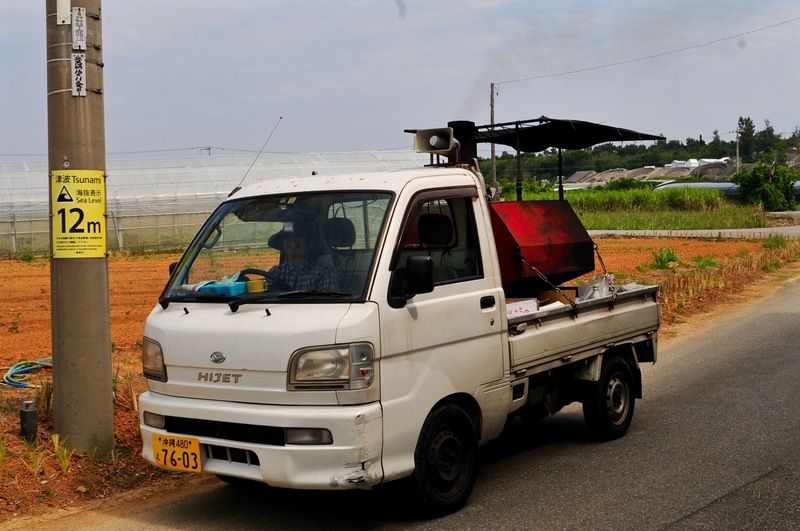 It is a Beni Imo truck! Check the sound system. 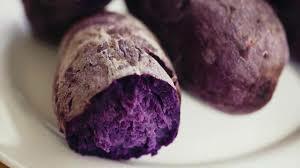 Beni Imo is a purple sweet potato that for centuries has been the staple diet of Okinawa. 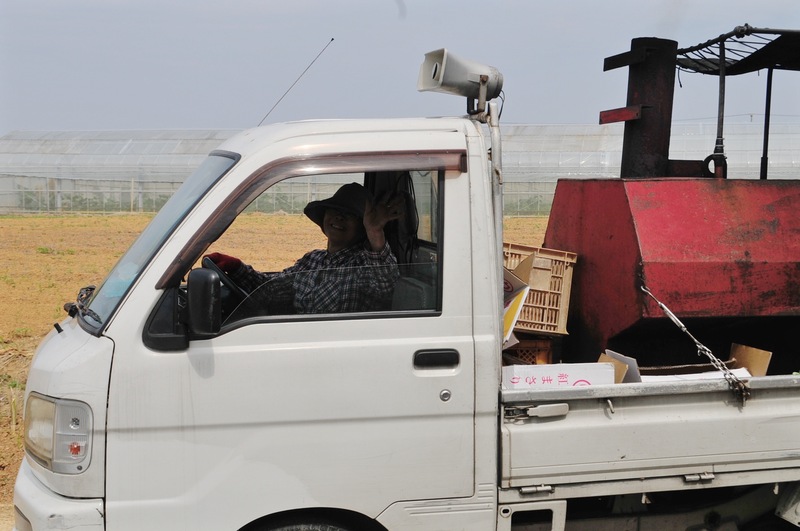 On the back of the truckette is a Beni Imo oven. I have seen these ovens at festivals and such but this is the first mobile one. It is like an ice cream van. People come out of their houses to stock up. The lady driving the truckette is of course a star. Sorry for poor photo. Baked Beni Imo is delicious. Aha! 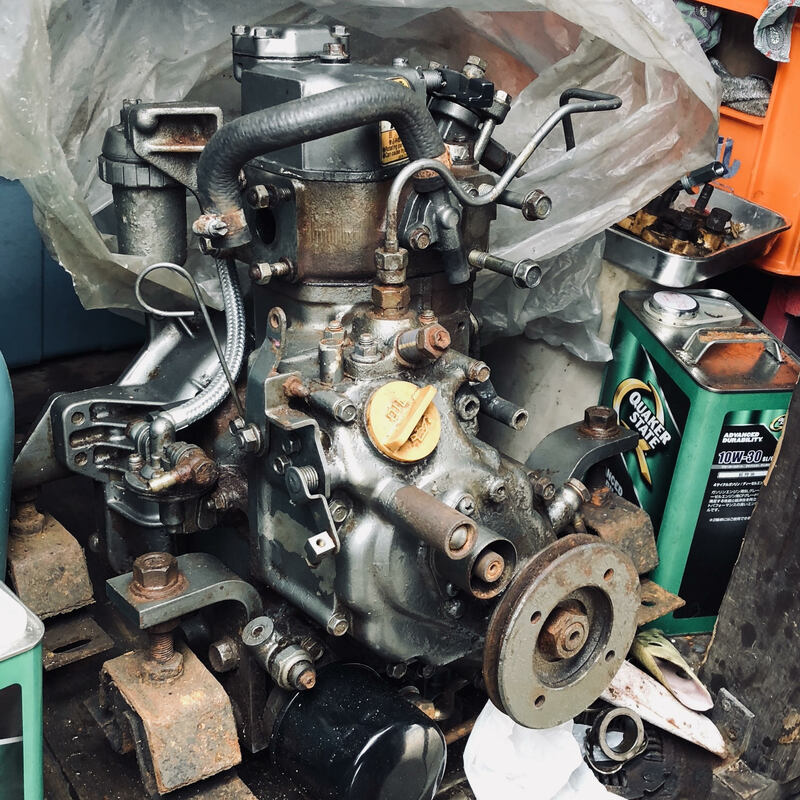 I think you have the pull cord fitting on your engine (like a Seagull) – a very fine thing, as you have to be Garth to start it with the handle. Paint looks great. The sound track on the video is startling. I hate anything that alludes to lust.